Evergreen perennial. Vigorous growing groundcover for shady areas. 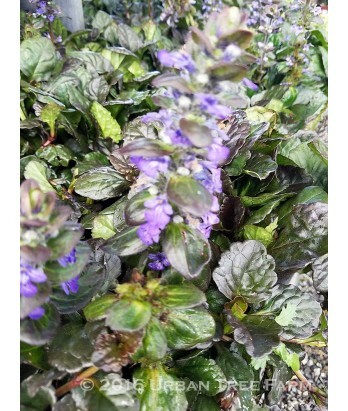 Spikes of blue-purple flowers rise above green and purple colored foliage spring through summer. Foliage color deepest in full sun, but leaves may burn or plant may need more water if planted a hot area. Deer resistant. Moderate water needs once established. Adaptable to various soil conditions. Hardy to 0°F or below.